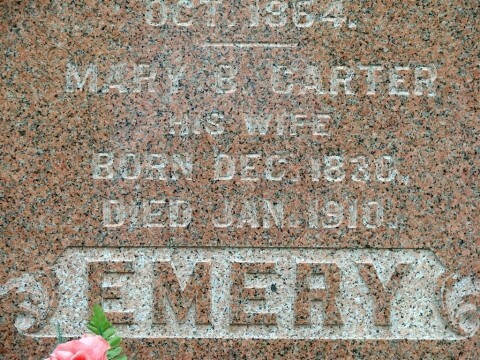 Mrs. Mary B. Emery of Stowe is probably the only woman in this vicinity (Eden) who served in the Civil War. Mrs. Emery was formerly Miss Mary B. Carter of Searsport, Maine, and was of patriotic descent, her grandfather, Joseph Carter, having served five years in the Revolutionary War. Her husband, George Emery was a sailor. After their marriage they came to live in Eden, Mr. Emery's former town. On Aug. 6, 1862, Mr. Emery enlisted in Company F., 11th Vermont Regiment, from Irasburg. He was mustered into service at Brattleboro in September and was stationed with the regiment near Washington for nearly two years. In early spring of 1864 he sent for his wife to join him. Disposing of her household goods, and taking her six children, the eldest thirteen, and the youngest two years of age, Mrs. Emery went to Fort Thyre (Thayer), where her husband was then stationed. In less than two weeks after her arrival her husband's regiment was ordered to the front, and with the regiment he fought in the Battles of Spottsylvania, Cold Harbor and Fredericksburg, and was in the skirmish at Weldon Railroad, where with many of his comrades, were taken prisoner on June 23rd, and was sent to Libby Prison, and afterward to Danville, and finally to Andersonville, where he died of starvation in the fall of 1864. After Mr. Emery's capture, Mrs. Emery, being left without means of support, was appointed to serve as laundress for the company then stationed at Fort Thayer, and as the company was entitled to two laundresses, Mrs. Emery, assisted by the older children, secured both appointments, and received two soldiers rations. She washed for many of the soldiers, besides washing for the colonel's family and other officers. During the summer she was quite sick for some time, and the washing was done by the children. During her illness she was tenderly cared for by a colored woman who lived near her. In the fall she moved to Fort Saratoga and lived in a stockade building until January 1865, when Mrs. Baxter, wife of the Vermont Senator, induced her to return to Vermont, giving her some money and securing her government transportation near as Waterbury. She returned to Eden, where she supported her family by hard labor. At one time, while away from home at work, her house caught fire and burned to the ground with all its contents. She returned at night to find that she had no home and nothing to do with. Owing to some mistake in reporting Mr. Emery's death to the department at Washington, it was ten years before Mrs. Emery received a pension. Samuel Morgan of Eden, becoming interested in the matter, found men that knew all about it and thus secured the pension for her. Mrs. Emery came to Stowe in 1891 to be with her son, the Rev. G. A. Emery, at that time pastor of the Methodist Church there. She went back to Eden for a while, but returned several years ago to Stowe, and still resides here. She is 74 years of age and in feeble health. Her widow's pension is $12 a month, a small return for so great a sacrifice. Source: Burlington Free Press, reprint of an article in News and Citizen, 4 April 1906. Mrs. Mary D. Emery, who died at the home of her daughter, Mrs. Amanda Adams, in Eden last week, was formerly a resident of Stowe for about fifteen years, coming here with her son, Rev. Geo. A. Emery, at that time pastor of the Methodist Church here. She went to Eden to live with her daughter about three years ago. She was about seventy-seven years of age, and was not only a soldier's widow, but saw service herself in the Civil War. The "irrepressible" Samuel Morgan, formerly of Johnson, showed us a letter from Washington, lately received, giving the information that Mary B. Emory (sic), widow of George Emory (sic), had been granted a pension for herself and six children -- the back pay amounting to $2000.00. The case has baffled the skill of several legal gentlemen for about 8 years, from the fact that Mr. Emory stands on the records of the Department as a deserter to the rebel army from Andersonville prison; but when Mr. Morgan, who operates through a firm in Washington, took the case, he got the affidavits from every surviving soldier, of the regiment who was at the prison at the time of Emory's death, some fourteen in all, which made the case so clear that the commissioner decided that the record must have been in error, and granted the pension as stated, which is a god-send to the poor widow, and a just decision. We have heard of several "tough cases" that have been speedily brought to a successful termination through the vigilance of Mr. Morgan and the firm he is connected with; so we have no hesitation in re recommending any who have claims of this nature to entrust them to him.